Liège ([ljɛʒ], lieːʃ in Belgium; Walloon: Lidje; Dutch: Luik, [lœyk]; German: Lüttich) is a major city and a municipality in Belgium. 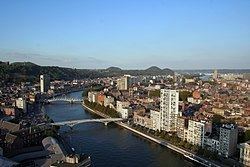 It is the main city of the province of the same name, Liège, in Belgium's francophone region of Wallonia. The city is situated in the valley of the Meuse River, in the east of Belgium, not far from borders with the Netherlands (Maastricht is about 33 km (20.5 mi) to the north) and with Germany (Aachen is about 53 km (32.9 mi) north-east). At Liège the Meuse river meets the river Ourthe. The city is part of the sillon industriel, the former industrial backbone of Wallonia. It still is the principal economic and cultural centre of the region. The name is Germanic in origin and is reconstructible as *liudik-, from the Germanic word *liudiz "people", which is found in for example Dutch lui(den), lieden, German Leute, Old English lēod (English lede) and Icelandic lýður ("people"). It is found in Latin as Leodicum or Leodium, in Middle Dutch as ludic or ludeke. Until 17 September 1946 the city's name was written Liége, with the acute accent instead of a grave accent. In French the city has the epithet la cité ardente (the fervent city). Although settlements already existed in Roman times, the first references to Liège are from 558, when it was known as Vicus Leudicus. Around 705, Saint Lambert of Maastricht is credited with completing the Christianization of the region, indicating that up to the early 8th-century the religious practices of antiquity had survived in some form. Christian conversion may still not have been quite universal, since Lambert was murdered in Liège and thereafter regarded as a martyr for his faith. To enshrine St. Lambert's relics, his successor, Hubertus (later to become St. Hubert), built a basilica near the bishop's residence which became the true nucleus of the city. A few centuries later, the city became the capital of a prince-bishopric, which lasted from 985 till 1794. The first prince-bishop, Notger, transformed the city into a major intellectual and ecclesiastical centre, which maintained its cultural importance during the Middle Ages. Pope Clement VI recruited several musicians from Liège to perform in the Papal court at Avignon, thereby sanctioning the practice of polyphony in the religious realm. The city was renowned for its many churches, the oldest of which, St Martin's, dates from 682. Although nominally part of the Holy Roman Empire, in practice it possessed a large degree of independence. The strategic position of Liège has made it a frequent target of armies and insurgencies over the centuries. It was fortified early on with a castle on the steep hill that overlooks the city's western side. In 1345, the citizens of Liège rebelled against Prince-Bishop Engelbert III de la Marck, their ruler at the time, and defeated him in battle near the city. Shortly after, a unique political system formed in Liège, whereby the city's 32 guilds shared sole political control of the municipal government. Each person on the register of each guild was eligible to participate, and each guild's voice was equal, making it the most democratic system that the Low Countries had ever known. The system spread to Utrecht, and left a democratic spirit in Liège that survived the Middle Ages. At the end of the Liège Wars, a rebellion against rule from Burgundy that figured prominently in the plot of Sir Walter Scott's 1823 novel Quentin Durward, Duke Charles the Bold of Burgundy, witnessed by King Louis XI of France, captured and largely destroyed the city in 1468, after a bitter siege which was ended with a successful surprise attack. Liège was technically still part of the Holy Roman Empire. After 1477, the city came under the rule of the Habsburgs and, after 1555, under Spanish sovereignty, although its immediate rule remained in the hands of its prince-bishops. The reign of Erard de la Marck (1506–1538) coincides with the Renaissance Liégeoise. During the Counter-Reformation, the diocese of Liège was split and progressively lost its role as a regional power. In the 17th century the prince-bishops came from the Bavarian family Wittelsbach. They ruled over Cologne and other bishoprics in the northwest of the Holy Roman Empire as well. During this medieval period, three women from the Liège region made significant contributions to Christian spirituality: Elizabeth Spaakbeek, Christina the Astonishing, and Marie of Oignies. In 1636, during the Thirty Years' War, the city was besieged by Imperialist forces under Johann von Werth from April to July. The army, mainly consisting of mercenaries, extensively and viciously plundered the surrounding bishopric during the siege. Liège's fortifications were redesigned by Henri Alexis Brialmont in the 1880s and a chain of twelve forts was constructed around the city to provide defence in depth. This presented a major obstacle to Germany's army in 1914, whose Schlieffen Plan relied on being able to quickly pass through the Meuse valley and the Ardennes en route to France. The German invasion on August 5, 1914 soon reached Liège, which was defended by 30,000 troops under General Gérard Leman (see Battle of Liège). The forts initially held off an attacking force of about 100,000 men but were pulverised into submission by a five-day bombardment by the Germans' 42 cm Big Bertha howitzers. Due to faulty planning of the protection of the underground defense tunnels beneath the main citadel, one direct artillery hit caused a huge explosion, which eventually led to the surrender of the Belgian forces. The Belgian resistance was shorter than had been intended, but the twelve days of delay caused by the siege nonetheless contributed to the eventual failure of the German invasion of France. The city was subsequently occupied by the Germans until the end of the war. Liège received the Légion d'Honneur for its resistance in 1914. The Germans returned in 1940, this time taking the forts in only three days. Most Jews were saved, with the help of the sympathetic population, as many Jewish children and refugees were hidden in the numerous monasteries. The German occupiers were expelled by the Allies of World War II in September 1944 but Liège was subsequently subjected to intense aerial bombardment, with more than 1,500 V-1 and V-2 missiles landing in the city between its liberation and the end of the war. On 13 December 2011, there was a grenade and gun attack at Place Saint-Lambert. An attacker, later identified as Nordine Amrani, aged 33, armed with grenades and an assault rifle, was reported as having attacked people waiting at the bus stop shortly before 1:30 p.m. CET. Six fatalities were reported, including the attacker (who shot himself), and 123 people were reported injured, among them a two-year-old child who sustained life-threatening injuries. Police reported that the situation was "under control" by 2:50 p.m.
On 1 January 2013, the municipality of Liège had a total population of 197,013. The metropolitan area has about 750,000 inhabitants. Its inhabitants are predominantly French-speaking, with German and Dutch-speaking minorities. Like the rest of Belgium, the population of minorities has grown significantly since the 1990s. The city has become the home to large numbers of Moroccan, Algerian and Turkish immigrants. The 16th century palace of the Prince-Bishops of Liège is built on the Place St Lambert, where the old St. Lambert's Cathedral used to stand before the French Revolution. An archeological display, the Archeoforum, can be visited under the Place St Lambert. The church of Saint-James (Saint-Jacques) is probably the most beautiful medieval church in Liège. It is built in the so-called Flamboyant-Gothic style, while the porch is early Renaissance. The statues are by Liège sculptor Jean Del Cour. Saint-Jacques also contains 29 spectacular 14th century misericords. The main museums in Liège are: MAMAC (Museum of Modern & Contemporary Art), Museum of Walloon Life, and Museum of Walloon Art & Religious Art (Mosan art). The Grand Curtius Museum is an elegantly furnished mansion from the 17th century along the Meuse River, housing collections of Egyptology, weaponry, archaeology, fine arts, religious art and Mosan art. The city is well known for its very crowded folk festivals. The 15 August festival ("Le 15 août") is maybe the best known. The population gathers in a quarter named Outre-Meuse with plenty of tiny pedestrian streets and old yards. Many people come to see the procession but also to drink alcohol and beer, eat cabbage, sausages or pancakes or simply enjoy the atmosphere until the early hours. The Saint Nicholas festival around the 6 December is organized by and for the students of the University; for 24 hours, the students (wearing very dirty lab-coats) are allowed to beg for money for drinking. In Spring Liège also hosts the Liège–Bastogne–Liège cycle race, the oldest of the classics in cycling. The circuit starts from the city of Liège, goes to the city of Bastogne and returns to finish in the Liège suburb of Ans. The second half contains most of the climbs in the race, such as the Stockeu, Haute-Levée, La Redoute, Saint-Nicolas and the Col de Forges. With the 2009 Vuelta a España visiting Liège after four stages in the Netherlands, Liège is the only city that can boast having hosted stages of all three cycling Grand Tours. On the surface the only possible rescue was held to be via Mamonster. A heading was driven towards Beaujone with all possible speed, including blasting. The trapped miners heard the rescuers, the rescuers heard the trapped miners. Five days after the accident communication was possible and the rescuers worked in darkness to avoid the risk of a firedamp explosion. By 7pm that evening an opening was made, 511 feet (156 m) of tunnel had been dug by hand in five days. All of the 74 miners in Goffin's part survived and were brought to the surface. Liège is served by many direct rail links with the rest of Western Europe. Its three principal stations are Liège-Guillemins railway station, Liège-Jonfosse, and Liège-Palais. The InterCity Express and Thalys call at Liège-Guillemins, providing direct connections to Cologne and Frankfurt and Paris-Nord respectively. Liège sits at the crossroads of a number of highways including the European route E25, the European Route 411, the European Route E40 and the European Route E313.